Despite the recent rain water levels remain low. Several people have learned the hard way, running aground on Little Denny and the club has incurred yet more expense in repairing damaged props. PLEASE TAKE CARE. Barry Osborne, whose sad passing was announced recently, will be cremated at Bristol South Crematorium on Monday the 03-Dec-18 at 12:00 midday. Didn’t the temperature change quickly? The forecast was right but it still came as a bit of a shock. At least the first cold weekend was sunny. The club was buzzing on Saturday 17-Nov-18, with several sailors making the most of the sunshine either for a relaxing sail or to try an Aero, along with six Chew 29er crews and 16 youngsters from the RYA SW Topper zone squad training. AND two of the university groups seriously practising team racing tactics. It was lively, colourful and very cheerful. Late afternoon, everyone collaborated to ensure we had a dry floor and space to set up for the evening Celebration supper and Prize giving. Thank you to the willing team who transformed the clubhouse and everyone (over 70 of you, including several of our youth sailors) who came to the event. We were delighted to welcome our guests Daisy Collingridge and Bryony Shaw from the British Sailing Team along with Bryony’s family. They all thoroughly enjoyed the relaxed and friendly atmosphere. 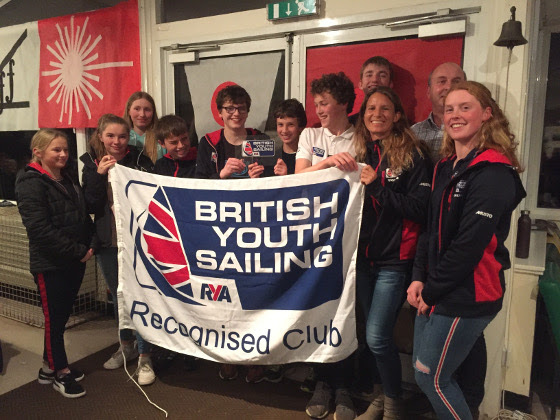 After a delicious meal (thank you Rob), Bryony and Daisy presented the club with the British Youth Sailing Recognised Centre flag and plaque and gave short resumes of their sailing careers. Useful messages for all of us- keep it fun, value the friendships, ask questions, appreciate the support and so much more. Several of us liked “areas of gain” rather than things to work on or weaknesses!! Club trophies and points series prizes were also presented. Sunday 18-Nov-18 was another lovely sunny but cold day – 3 hats for me on rescue duty and I was just warm enough.! It looked like great sailing for cruisers and racers alike. Wednesdays have been quite quiet on the water, A few keen (mad)sailors braved another very chilly day last week and it was great to see several members taking advantage of the PB instructors offer of refresher boat handling sessions. Thank you to everyone involved. This week? As I write the forecast is for a lot of wind!! Nevertheless the chat and camaraderie in the clubhouse will have been, as ever, warm and welcoming. Coming up: Bristol Brew 1st and 2nd December- tiny courses, multiple team races, good viewing AND loads of lake for general sailing and racing.